Claire Driscoll sees boaters often getting trapped in the shallow Carnival Bayou waterway next to her Pleasure Avenue home. Claire Driscoll marvels at the spectacular views of the water that unfold from the windows of her bayfront home on Pleasure Avenue. But the beautiful scenery is somewhat deceiving. At low tide, the shimmering water is replaced by an ugly, soup-like muck that has trapped many unsuspecting boaters who tried to navigate through the shallow channel known as Carnival Bayou, Driscoll noted. “It’s kind of funny to see all those boats stuck out there. But it’s not funny if you’re on one of those boats,” said Driscoll, who has lived on Pleasure Avenue at 16th Street for 18 years. 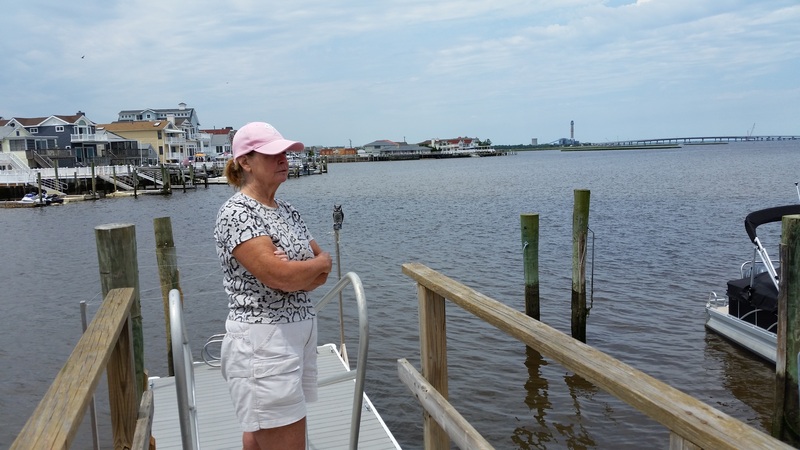 Driscoll and other Ocean City homeowners living next to Carnival Bayou have been frustrated by the sediment-clogged waterway, but they will finally get some relief this fall when the city launches the next phase of an ambitious dredging program to deepen the bayfront. At a town hall meeting Saturday, city representatives announced that Carnival Bayou, South Harbor and Sunny Harbor are the next areas in line for dredging. The waterway in front of the Bay Bridge Condominiums on the north side of Ninth Street has been designated as an alternative site for dredging this year, if the city secures a regulatory permit for that area. Environmental permits are already in place for Carnival Bayou, between 16th and 17th streets, South Harbor, between Tennessee Avenue and Spruce Road, and Sunny Harbor, between Arkansas Avenue and Walnut Road. A view of Carnival Bayou, one of the sediment-choked waterways scheduled to be dredged this fall. The plan is to dredge those areas in September, October and November. 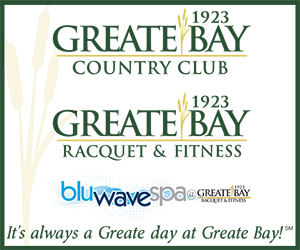 The city’s permit would allow dredging to begin on July 1, but Mayor Jay Gillian and other city officials said the projects will likely have to wait until the fall because of objections from local residents about doing the work during the summer vacation season. The city began the first round of dredging last year as part of a $20 million program proposed by Gillian for 2016, 2017 and 2018. In 2017, the municipality plans to spend $7.5 million for dredging projects, said Frank Donato, the city’s chief financial officer. 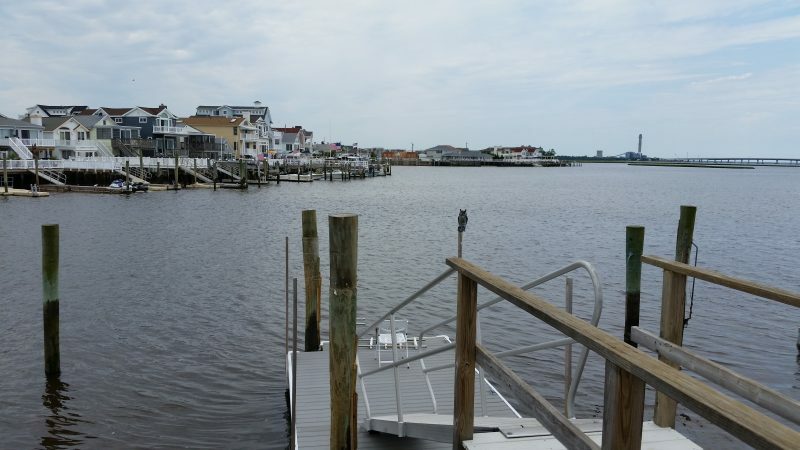 Ocean City’s multifaceted dredging program is being touted as a model for all New Jersey shore towns that are dealing with the dangerous problem of sediment-choked waterways. 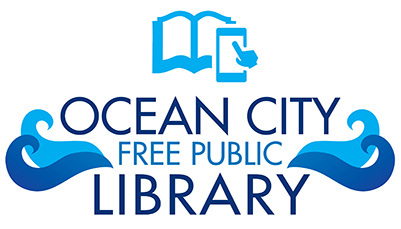 “What Ocean City is doing is unprecedented,” said Eric Rosina, an executive with ACT Engineering Inc., the town’s dredging consultant. 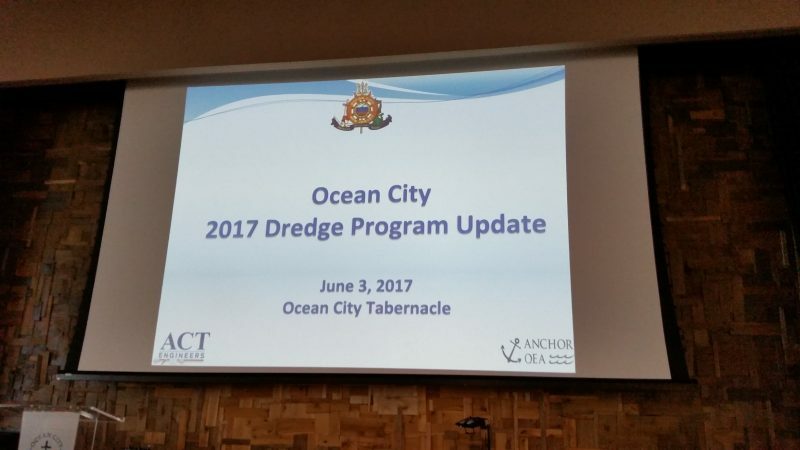 Representatives of ACT Engineering joined the mayor and other city officials to discuss the latest plans for the dredging program during a town meeting at the Ocean City Tabernacle attended by about 80 residents. Gillian urged homeowners to be patient, but said he understood their frustration with all of the regulatory hurdles and environmental restrictions that have slowed down the dredging projects. 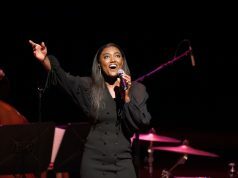 “We’re doing everything we can,” Gillian told the audience. Mayor Jay Gillian speaks to the audience while flanked by ACT Engineering representatives Eric Rosina and Carol Beske. Chris Terrels, one of the audience members who spoke during the meeting, said the shallow lagoons are preventing residents from enjoying their boats and bayfront homes. Terrels, who owns a condo on Waterview Boulevard, urged city officials to begin the dredging work as soon as possible to clear the channels for boat traffic. “You can’t navigate now, so just put the dredges in the water,” he said. In an interview, Terrels said he stopped keeping his boat in Ocean City because he could no longer use it in the clogged waterways. “The algae is so thick, it looks like a golf course,” he said of the lagoon near this home. Other boat owners living along the back bays complained that they are trapped at their slips or must wait until high tide to gain access to the water. The city plans to spend $7.5 million for its 2017 dredging program. During his remarks, the mayor warned that the thick sediment also poses a danger to anyone who might have the misfortune of falling into it. “This is not just about boating. 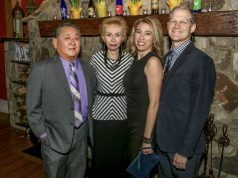 It’s about the whole quality of life in Ocean City,” Gillian said. To address the problem, Gillan recapped the city’s plans for a comprehensive dredging program that would span the island from “tip to tip.” In total, he estimated that 1 million cubic yards of sediment must be cleared out of the lagoons and channels, enough muck to fill about 15 football stadiums. ACT Engineering representatives emphasized that the success of the program depends on creating more space at the city’s main disposal site for dredge spoils. Known as Site 83, the facility, off Roosevelt Boulevard, has a capacity of about 300,000 cubic yards. However, it must first be emptied out before it begins accepting new dredge spoils from the projects that will be done in the fall. 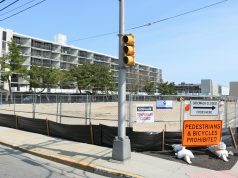 In December, the city applied for a permit from the New Jersey Department of Environmental Protection and U.S. Army Corps of Engineers to conduct dredging along the entire length of the island. Among other things, the application also seeks permission to convert what is now a temporary access road serving Site 83 into a permanent one. Having a permanent road would speed up the process of having trucks haul away the dredge spoils. Also at Saturday’s meeting, city officials described a new voluntary program that would allow homeowners to piggyback on the town’s regulatory permits to dredge their own boat slips. Homeowners would still have to pay for dredging their slips, but the new plan would relieve them of some of the costs and headaches of doing the work on their own, including finding a disposal site for their dredge spoils. “It really makes your life easier,” Carol Beske, an executive with ACT Engineering, told the audience. Dorothy McCrosson, the city solicitor, said details of the voluntary program are still being developed. Essentially, it would allow homeowners to obtain a municipal permit for the work, allowing them to dredge their own boat slips under the umbrella of the city’s dredging projects. 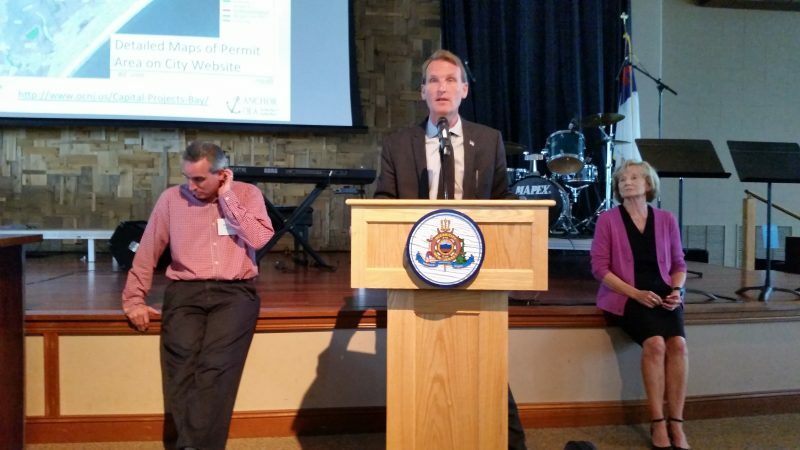 The cost of the municipal permit, as well as an inspection fee homeowners would pay, still must be determined, McCrosson said. The municipal permit would allow homeowners to hire a city-approved contractor to do the dredging work for their slips. “Ocean City is leading the way,” McCrosson said of the benefits of the dredging program to local homeowners. 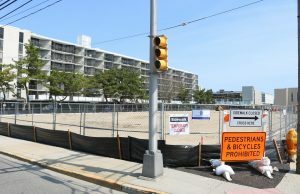 One resident, Jim Sabetta, a bayfront condo owner at Seventh Street and Pleasure Avenue, complained that the municipal permit would simply force homeowners to pay extra for dredging their boat slips. “We’ve got to kick up more money,” he said. Sabetta claimed it would be like if the city started charging homeowners each time potholes were filled in the local streets.